This topic contains 16 replies, has 3 voices, and was last updated by Ashutosh Ranjan 4 months, 2 weeks ago. I’m a Hindu. Can i pray to the Buddhas and Dorje Shugden as well as the Hindu Gods? I really like Buddhism but i don’t know if i can pray to them as well, will this cause a problem? Also, can i put the statues on the same shrine, because my friend said that this will disturb the energies. Dear Kiran Gupta, I am from Malaysia and we have quite a large Hindu community here. 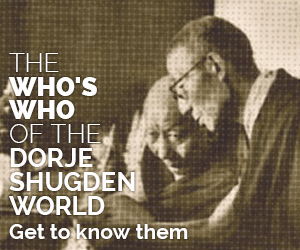 I have seen and personally know Hindu practitioners who pray to the Buddhas and Dorje Shugden. In fact, I have a Hindu friend who rely heavily on Ganesha and Dorje Shugden for protection and the success of his businesses. Ideally, it will be good to separate the altar, as some Hindu deities are un-enlightened beings. However, if that is not possible, you can place the Buddha statue in one corner of the altar, and the Hindu deities in the other corner. Or you can get a small cabinet like this (https://s-media-cache-ak0.pinimg.com/736x/94/9a/82/949a8275bade35cf437651f92704cc2a.jpg). 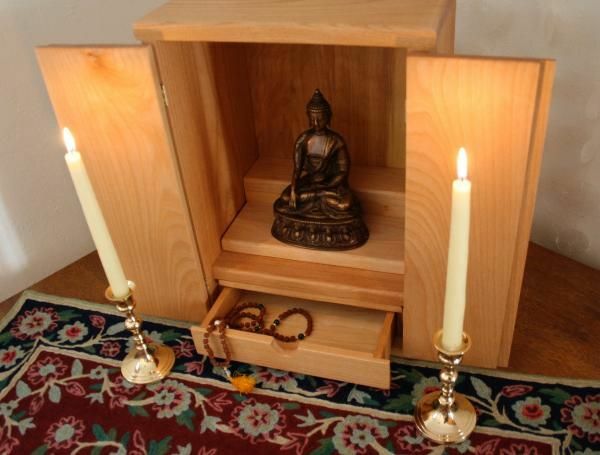 Traditionally, Dorje Shugden images (and all Dharma Protectors in general) are always placed inside a cabinet because his practice is sacred and also because he is very wrathful, so it is ok to have him enclosed inside a cabinet such as in the picture. Hope this answers your questions. This reply was modified 2 years, 11 months ago by sarah. I have read that Dorje Shugden is the offspring of Ganesha / Ganapati and Palden Lhamo. In order for him to emanate in worldly form, his mind had to enter the red seed of the mother and white of the father upon conception. Dorje Shugden won’t be offended if you keep him on the same altar as other deities but I think separating the altar is a matter of respect for Dorje Shugden since he is enlightened. In Buddhism we do not worship unenlightened beings like worldly gods and we don’t put them on the same level as Buddhas. Sorry more accurately I have been told that the feminine energy was Palden Lhamo. If someone can find a textual or scriptural source to verify this it would be perfect!!! The King of Obstructors, we know for sure is Ganapati; and the Queen of Existence, Machig, I have only heard that she is Palden Lhamo, but it’s difficult to find text for references. The best guess we can make is possibly Palden Lhamo’s peaceful form Machig Pelha Zhiwé Nyamchen. I really like this concept of Buddhism and Dharma Protector, where you don’t need to be a Buddhist to rely on Him. To be honest, if a deity is compassionate, He/She would actually care for you even if you are not a devotee of His/Hers, correct? So, as Sarah said, the Protector ideally should be kept in a cabinet due to his wrath and his practice being sacred. If we cannot for whatever reason, have the little cabinet for the Protector, can we just use any simple brocade to cover or must it be a specified brocade? 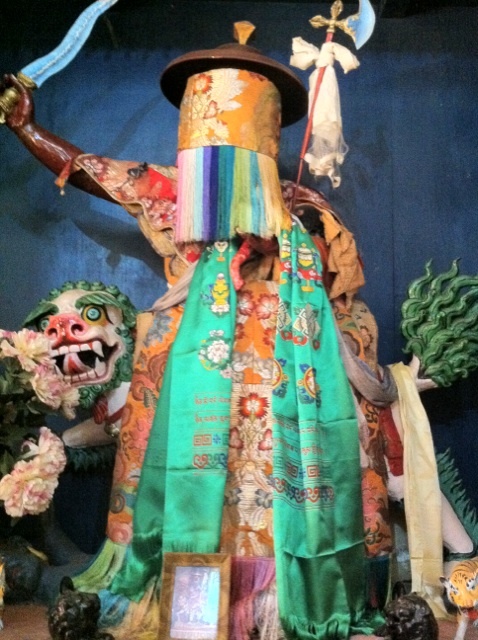 I have seen thangkas of Protectors which have a ‘curtain’ made from 5 pieces of different colors of brocade. Can this be modified for tsa tsas and statues instead of using a cabinet? 1) Since most of us have the statue in a private corner of our home, it would probably be unnecessary to cover the statue. 2) These days, we can see that there are several depictions of Dorje Shugden, and the statues are painted less wrathful. It is not necessary to cover a statue with peaceful appearance. 3) Again, it is a traditional way of keeping the statue. So, i dont really think there’s a right or wrong in this aspect. If for a certain reason one wants to cover their statue, but dont have a cabinet, then perhaps it is possible to make a veil like this (http://www.dorjeshugden.org/wp-content/gallery/dorje-shugden/shugden-statue-gaden-tibet.jpg). Though I think this is something used in the monasteries… possibly more to protect the statue rather than to cover it… Being in a public area such as the Tenkang or the Gompa, just imagine with people lighting incense and the doors and windows opened widely everyday… it is easy for dust to deposit on the statue… and if the statue’s face is painted with real gold dust, it is impossibly to wipe off the smog and dust with a cloth as that would remove the gold as well. I do not know what type of brocade is used, but I think the proper cloth used for the cover would not be a brocade, but plain silk cloth from the 5 Buddhist colors. 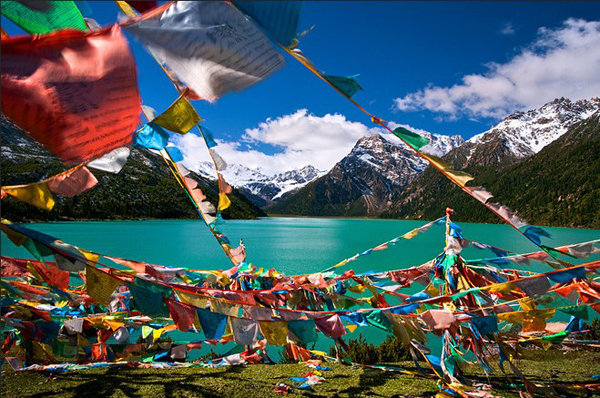 You can see the prayer flags for the colors. Also for the thangkas, all thangkas have a ‘curtain’ or more accurately called a cover. It actually functions to cover the painting in order to protect it especially when we roll it up. These days, thangkas are digitally printed, which we dont really have to worry about damaging the painting when we roll… but for the ones that are hand painted, they are very delicate and most of the time the painting itself is layered with gold. The cover helps to protect the painting from damage; and at the same time, when it is on display, one who’s good at displaying the thangka and roll up the cover to make beautiful design at the top of the thangka that can function like a lovely parasol above the Buddha image. This reply was modified 2 years, 9 months ago by sarah. From what I heard, protector practice used to be quite secret, and not usually openly practiced, meaning a Lama would only give the practice to certain qualified practitioners who requires the protector for higher practice such as Tantra. Therefore, traditionally, protectors are not openly displayed and usually hidden in a cabinet. However, seeing that most of us cannot uphold the strict requirements of tantra, but the protector practice is definitely very beneficial, some Lamas are very kind and open the practice to public, by releasing the prayers text which lay person can practice without initiation. Therefore, protector practice is now more open to public. Also, as Sarah said, sometimes Dharma protectors are depicted in a less wrathful way, so it is less “scary” for people to see. 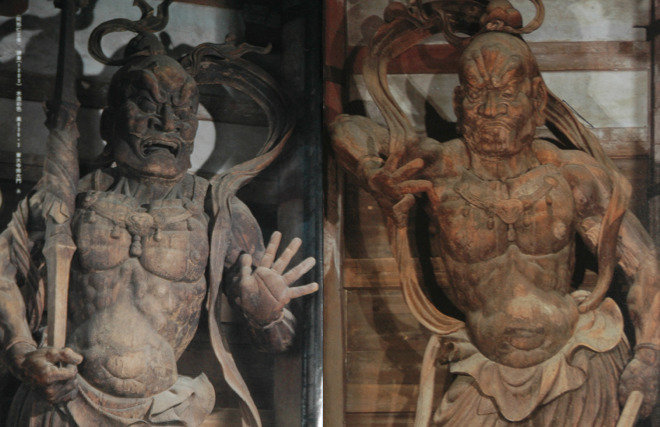 In fact, in many Chinese temples, there are many deities who are much more scary. Also, if you put the protector in your bedroom, make sure Dharma protector is place inside a cabinet with door. It is quite disrespectful if we change clothing in front of the protector. Not that the protector cannot see (because they have clairvoyance), but it is a sign of respect. Yah our Taoist temple deity is like that. The Door Gods sometimes people paint very fierce when you first walk inside temple and they are on the door. Zhang Dao Ling they always paint with one kind of black face. Just look at these gods, so fierce http://www.taoistiching.org/image/image71.jpg And some temple also got the hell realms statues. Actually why ah Dhamma protector is secret? Normally if you hide something is because is bad. If normally it is secret like that then why now is it open? Now I think, is probably because our kamma is so bad. We have so much negative kammas that is very difficult for us to practise. So the Lama let us practise Dhamma protector practice to help clear this kamma. Am I correct? Hmm… I think the word ‘secret’ in English gives it a little ‘negative’ connotation because people often associate keeping things a secret as hiding a negative deed or not allowing someone know about something due to selfish reasons. But in the case of secret practices in Tibetan Buddhism it means entirely different from that. Perhaps using the world ‘esoteric’ is more accurate for secret practices to avoid misconceptions. So what type of practices are secret? Higher Tantric practices are secret practices, and because in the past, Dharma Protector practice is only introduced to a student after they have received Tantric practice, it is thus by default made secret practice. 1) There is a danger of a student who’s not ready for the practice may misunderstand or misuse the practice. This is very dangerous as it not only harm the practitioner, but it directly affect the longevity of the practice during our generation. Remember, Buddha himself mentioned that Buddhism will not be destroyed by any outside influence but destroyed by Buddhists themselves. On a ‘smaller’ scale, it is the same principle with selected practices. Therefore, keeping it a secret is to protect the practitioner, and the practice. 2) If the Lama, upon examine his student and find that the practice is not beneficial for him/her, then the practice is kept secret. Beneficial in what sense? If the practice can help the student spiritually or not. If it can’t then there is no point in revealing or giving the practice to the student anyway. Also, the form of keeping practices a secret is not created and manufactured by Tibetan Buddhism. In fact, it originated from Shakyamuni himself, whom preached this form of esoteric practice to a selected few students that were ready and suitable for the teachings, the type of teaching that brings one quickly to Enlightenment. It started off very secret to the point that centuries after Buddha’s passing, no one knew about these esoteric practices. When these practices were later brought to Tibet and became institutionalized to what we know now as Tibetan Buddhism, and the esoteric practices are not too ‘secret’ anymore, infact, we see a decline in the number of people that benefit from the practice… creating only a handful of great masters, when in oppose a whole nation practicing this form of Buddhism, shouldn’t it create an Enlightened society by now, but that is not the case. So here we can already see, the importance of keeping very silent about the practices for efficacy sake. The benefit of keeping one’s practice a secret can also be known if we think about it logically, with the knowledge of how purification works. How does purification practices work? We purify our negative karma so that we don’t need to experience it’s effect anymore, and we can do this through confessional practices. Doing Confessional practices gives us a two fold benefit, which is to purify our past negative karma, and when we openly admit to our faults and mistakes, it will prevent us from making the mistake again, thus it protects us from creating new negative karma. Similarly, if it works in this positive aspect, this law of nature applies to the opposite. It was said that, during Lama Atisha’s trip to Tibet from India, everytime Lama Atisha manifested a downfall, he would stop the whole convoy, got out of his carriage and shouted at the top of his lungs, ‘I did this mistake… I did this downfall…’. He did that so many times to the point that his disciples begged Lama Atisha ‘Lama Atisha, we still have a long journey, please can we not do this every single time. In fact, everything you have confessed, we don’t even see it as any form of transgression and we don’t even understand why it is a downfall. We have so much faith in you already, you dont need to tell us what you have done wrong’. To that, Lama Atisha replied ‘Every small action when kept hidden grows and grows and finally it brings a big result. So inorder for it not to happen, I admit them (the negative actions) as soon as I see them’. Another point is that within the Gelug lineage, humility is an important point in our practice and keeping things secret helps us develop that. It was said that Lama Tsongkhapa, kept so many of his practices secret, that even his closes disciple did not know Lama Tsongkhapa had a vajra and bell. They only found out about it after Lama Tsongkhapa entered clear light. The above is my thoughts and what I have read and heard about secret practices. 1) Why is Dharma Protector practice openly practiced now? There are few reasons for this, and it is mainly due to the time and generation we live in which is filled with distractions. Many times, due to these distractions, Dharma practitioners don’t even get the chance to receive Tantric practices and thus if followed the traditional way, they would not receive Dharma protector practice as well. However, due to the kindness of our Gurus, and recognizing the difficulties experienced today, the Lamas such as Tsem Rinpoche have given us practices to seek the blessings and help of Dharmapalas such as Dorje Shugden in order for us to gain the benefits, without receiving his practice officially. But officially, if one has the opportunity and fortune to receive Dorje Shugden Sogtae (life entrustment), then that is the most ideal. This statement is not entirely accurate. Our negative karma can only be cleared through purification practices. No Buddha, Bodhisattva or Dharmapala can clear our negative karma, we have to do it ourselves. However, Dharmapala Dorje Shugden can help us in ways such as giving us good conditions that will ultimately lead us to do more spiritual practice. Of course the way he helps us varies according to our karma and what we need in order to reach our spiritual goals. Thank you, Sarah, this really makes sense, that keeping the practice secret helps us in practicing humility. That in itself, will ensure that there is no wrong motivation for wishing to have the practice. If we start with the wrong motivation, then there will be no result from the practice. I just love the concept of Buddhism in general. You can pray to anything and do Buddhist practices as well and it is not in any conflict in anyway. Although when others hear about mixing the religions together it may seem to be weird at first, but when u think deeper, it does make sense if the deities that we pray to are all enlightened, then why would they be bothered who we pray to? The main goal to spirituality is the self transformation that will be beneficial to us in the long run (not only in this life). Through the transformation we will be kinder, and more compassionate people. To me, that is the main goal where we build something that is not only for this life, but also for our next lives. Protector practices can be incorporated in our daily lives no matter what our faith is as these protectors are enlightened. Thus, there will be no conflicts that will happen. I think there is no problems to have the statue of Dorje Shugden being placed on the same altar as the Hindu Gods. I have a few friends that have placed these deities on the same altar and to pray to them at the same time, they have no problems at all. In fact, since Dorje Shugden is an enlightened protector, there will be of no problems to do their practices at different times as well. I have another friend that does his Hindu practices in the morning, and in the evening he does his Dorje Shugden practices. He does it with ease and said that it is very easy for him to do both practices at the same time. Thus, I will like to say that to do the practices together for even have the Hindu gods and Buddhas it will be alright as by the end of the day, what we are praying for is for enlightenment and through religious practice, no matter what religion, we will be able to achieve that. Vajrayan Buddhism originated from siddha dharma practitioners Padmashambhav and princess of mandi mandarva devi. Siddha dharma is mother of hindu religion of modern times as well as vajrayan Buddhism. Buddhism is not different religion from hinduism.